If the parents both carry the gene for "tan markings" all of the above mentioned roans may be found with a tan masking over the head and either whole tan or partly tan in the usual tan trim areas. In the orange roan it is often indistinguishable to our eyes from the rest of the coat colour. In the lemon roan, the tan mask and trim will be expressed in the dilute form of pale cream, again almost matching the body coat. The tanned areas may appear as solid or roaned areas. The factor for "roaning" is the most dominant of the particolour patterns as we know them. It seems to be a gene with a wide spectrum of variety in how it is expressed. Some roans are quite deep with a high proportion of black (in the blues), liver (in the liver/chocolate roans), orange (the counterpart of red) or lemon (the counterpart of golden) hairs compared to white hairs present in the roaned areas of the skin. There seems to be every combination of proportion of these mixed hairs right from very, very dark roan down to the lightest of roans in all of these colours where the white hairs are present in much higher proportion than the coloured hairs on the roaned areas of the coat. In general the darker roans are dominant over the more lightly marked roans. The areas of black (or liver/chocolate, orange or lemon) patching usually will cover the ears, both sides of the skull and around the root of the tail. There may be patches of colour anywhere else over the neck, legs, body and hindquarters. These markings may be partially or wholly absent with roaned areas in their place. The head may present as solid black but the most usual form is for a flash or blaze of roan to cover the majority of the muzzle and run up between the eyes, over the stop to the back skull. At this point, in the darker roans it would be usual for the head markings on the side of the skull to join over the occiput and in the lighter roans (or at least those light roans with few body patches) it is often the case that the blaze runs over the occiput with either no spot or a spot isolated from the other skull markings. All of these variations are considered correct. 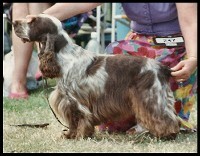 There is no hard and fast rule given as to HOW our breed's roans and particolours should be marked! 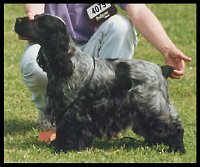 Many breeders fancy that even markings, particularly over the head are the most pleasing, however this is just "breeder's fancy" and it is NOT a requirement of the breed standard. Uneven or even absent patching therefore should not be penalised. A beautiful head with the correct balance and proportion, good stop and a kind eye and expression will always look good no matter what the markings are. 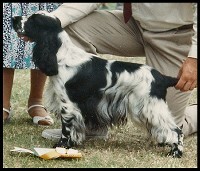 Anything other than a true head may not be flattered by uneven markings and judges should take into account the fact that this Cocker may have a better (although not perfect head) than first thought. Roaned stripes often appear inside or indeed outside the ear leather. This is not a fault either. There is no such thing as a mismarked roan or particolour! Patched areas may be small or quite large ranging from between 10% and 90% approximately of the whole coat. In general the more extensively patched pattern is more dominant than that with fewer smaller patching. Unusual distribution of patching can create an optical illusion. If the head of a particolour is wholly or almost completely black, it may look rather "overdone" when in fact it may be well proportioned and balanced. A foreleg or hindleg that is very heavily marked with a large patched area may look unbalanced when compared to the more conventionally marked limb. NOTE: The soles of the feet of roans are always fully pigmented. They will be completely black in blues, oranges or lemon roans with black pigmentation and brown in liver/chocolate roans, orange or lemon roans with brown pigmentation. The only exception to this is when they are new born puppies. At this time, each foot will have a fully pigmented line around the outer edge of the sole. The line will gradually be in filled with pigment appearing daily until completely covered at about 10 days old. It is also said that the roofs of the mouths of roans are also wholly pigmented as adults. Black & White (ticked with flecks of black) The pigmented areas of the skin including the nose and around the eye rims and mouth are black. The pink areas of skin are sprinkled with small areas of black pigmented skin giving rise to black flecks of hair. These flecks may be few in number or quite densely spread giving an illusion of almost light roan in appearance. Genetically this is quite a different colour however, and can be distinguished by a true light roan by looking at the soles of the feet. On a ticked dog, the soles follow the main body pattern and will have definite areas of black and white/pink contained within the soles. On a roan, they will be all black. Liver & White (ticked with flecks of brown) always with brown pigmentation. The pigmented areas of the skin including the nose, eye rims and lips are brown. The soles of the feet have definite areas of brown and white/pink. Orange & White (ticked with flecks of orange) with black pigmentation. The pigmented areas of the skin including the nose, eye rims and lips are black. The soles of the feet are black and white/pink. Orange & White (ticked with flecks of orange) with brown pigmentation. The pigmented areas of the skin including the nose, eye rims and lips are brown. The soles of the feet have definite areas of brown and white/pink. Remarks about ticking patterns apply to all these colours, pigmentation being black or brown depending on the colour heading. Newborn pups show no ticking but within a few weeks this develops increasingly as the pup matures. The "..and White (ticked)" colour pattern is separate from the roan factor pattern and also from the "..and White" pattern. The ticked pattern falls between the other two pattern types being recessive to roan (which is dominant over all other patterns except solid) and dominant over the "..and White" pattern.